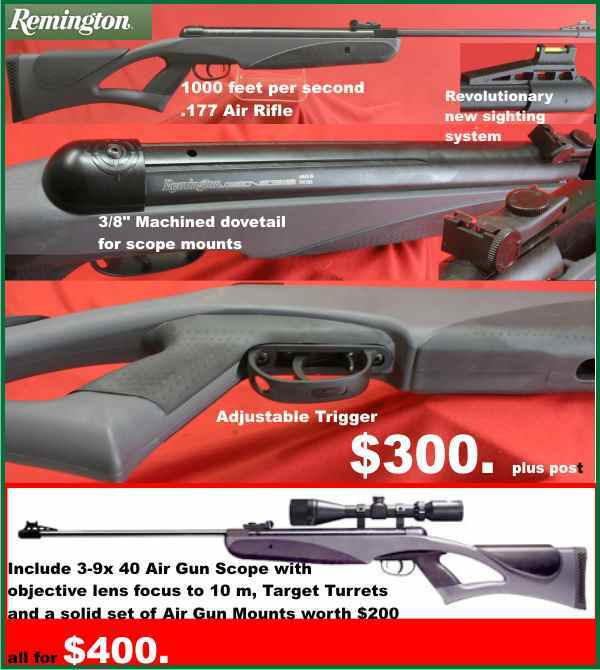 Welcome to the Thirty Eighth Edition of the Owen Guns Bulletin. Ten shot .22 long Rifle Bolt Action. Q.D. 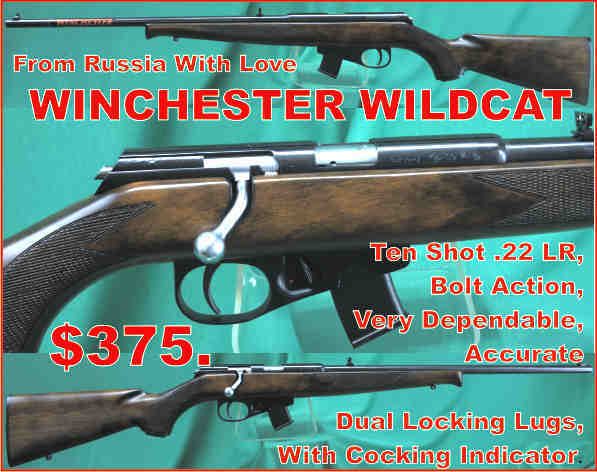 Sling swivel studs, ten shot magazine, duel locking lugs, cocking indicator, safety catch leaver, dovetailed for scope mounts, very dependable rifle, made in Russia for Winchseter. 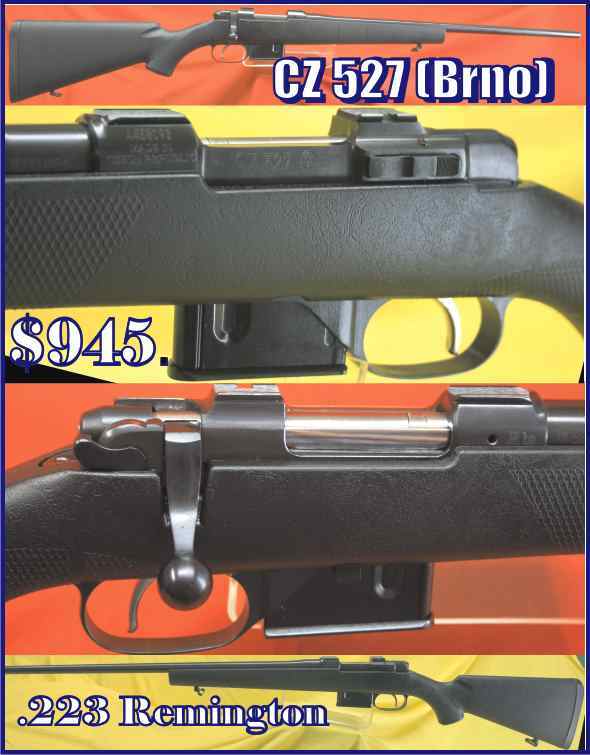 The Long serving CZ Brno Mini Mauser Action now chambered in the most popular calibre of our age the .223 Remington.Includes a detachable magazine, QD swivels,synthetic stock. Give the wife a break stop cleaning your cartridge cases in the dish washer, or the washing machine, no more hassle drying them in the oven. 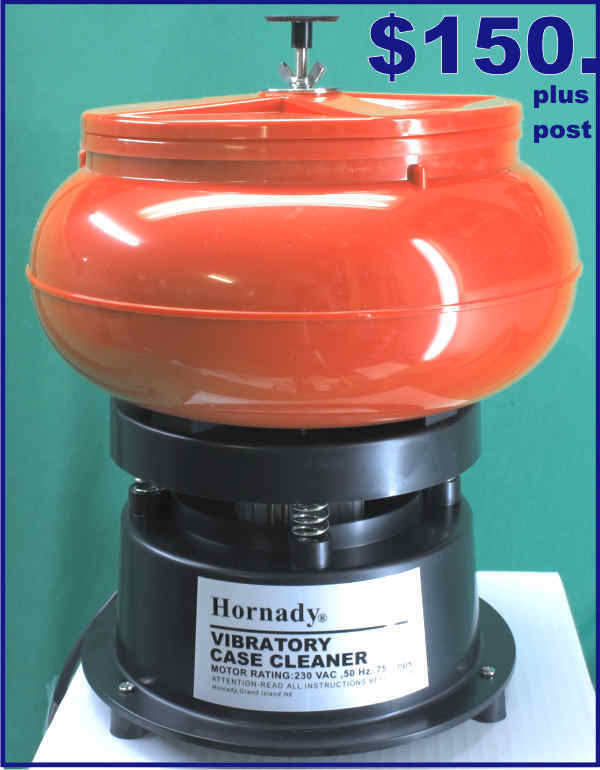 Get the Vibratory Case Cleaner from Hornady. • Incredibly rugged – the Riflemans prime main tube aircraft-grade aluminum to withstand heavy, repeated recoil. $300. for the Genesis $400. 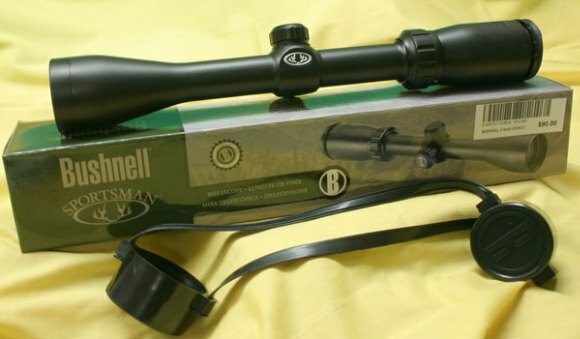 includes the 3-9×40 Air Rifle Scope. 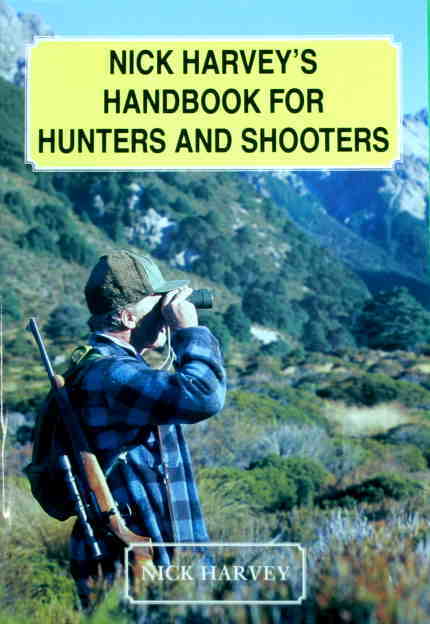 Nick Harvey has spent the last 40 years as the Gun Editor of the Sporting Shooters magazine. During that time he has travelled the world and hunted on nearly every continent for every type of game animal. This is a very special price of $15.oo plus $2 postage for all of Australia. At this price every hunters can afford one. 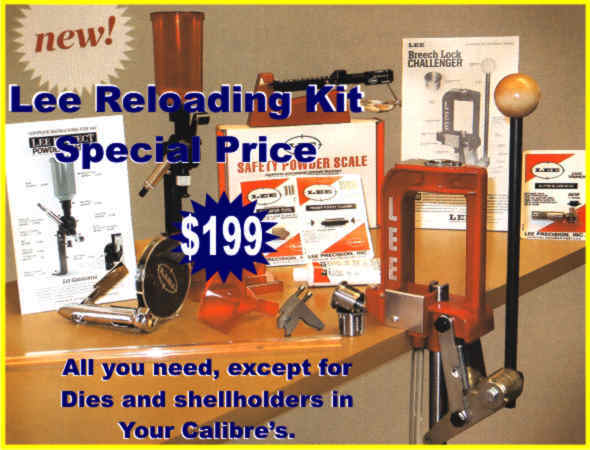 Lock time is the interval of time which elapses from the instant when the final pressure to release the trigger has been completed until the priming mixture has been crushed and explodes. It includes the time for the trigger and sear movement to release the firing pin, and for the latter to fly forward and indent the primer. Practically it depends upon the length of firing pin travel and strength of the firing pin spring or what is sometimes called the mainspring. While the old fashioned hammer rifles and shotguns probably have a longer lock time than any others. Others that may be taken as one having a rather long lock time are the Mauser 98, the Enfield M17, are all similar to the Springfield Model 1903 rifle action in which the firing pin travel is rather long, and the lock time has been measured as being approximately .0057 second. 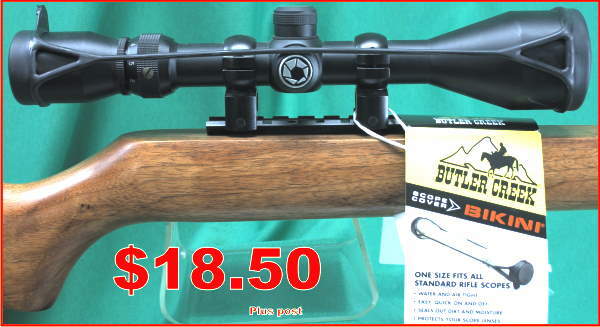 The lock mechanism of the European Target rifles such as JGA with its very short firing pin travel may also be regarded as a good example of short lock time, its time being approximately .0022 second. Recent study of expert rifle marksmanship has shown that for the finest results the lock time should be as short as possible, for with a slow lock a slight movement of the weapon can take place between the time pressure was applied to the trigger (when presumably the aim was correct) and the instant the primer explodes. 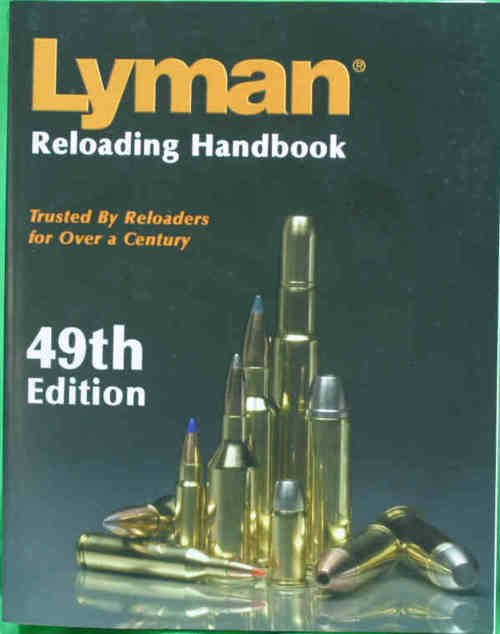 This time is more important in offhand shooting, and in shooting at moving targets, when rifle and target are more or less in motion while the trigger is being pressed and the lock is operating, than in benchrest shooting and shooting from the rifleman’s standard prone (lying down) position when the rifle is held approximately steady and the target does not move. But in most weapons of modern design effort has been made to reduce lock time. However, the firing pin travel should not be shortened or the firing pin spring strength altered to such extent as would decrease proper ignition as described above. Any lack of inertia can cause erratic ignition of the primer, this will effect accuracy much worse than a longer lock time. When an amateur attempts to shorten lock time he frequently injures ignition to such an extent that accuracy is seriously impaired. A trigger mechanism should always be tested from machine rest, together with variations in weight of blow, movement of parts, and strength of mainspring to assure that decrease in time is not had at the expense of accuracy. 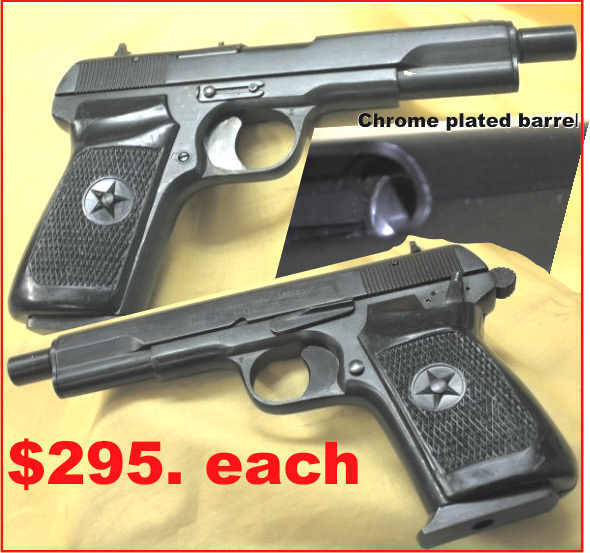 Modern hammerless shotguns, side by sides and under and overs usually have a very satisfactorily short lock time as they have very powerful mainsprings and very short travel of the springs. One instance where compactness has extra benefits. Continued in Edition 39. Smokeless powder, is what we all call it, but it is not smokeless, as it does produce a smoke. It is a lot less smoke than the original black powder, which is another anomaly as it produces white smoke, not black. The other anomaly, important only as a description, is that it is not a powder it is more like a small grain, but powder has been the traditional name for four hundred years or so, who are we to withstand history, so powder it will remain. Smokeless powder begins with the production of nitrocellulose of which there are many types but to manufacture cartridge powder it must be of a specific type. It is produced from cellulose or vegetable fibre, the most common material being cotton “linters” and wood pulp. Linters are the extremely short, fine cotton fibres removed from cotton seed after all fibres useful in fabric making have been salvaged. Linters are essentially a by-product of no value to the fabric industry, so are disposed of to powder and plastic producers. Baled linters received at the powder mill have been carefully washed and purified to remove all natural oils, so are ready to be made directly into nitrocellulose. Each bale is sampled and tested to insure no contamination is present. Bales are broken and the compressed material is fed through special machines which fluff it up and remove any foreign material. Cellulose is highly hygroscopic (moisture-absorbing) so it is necessary to dry the fluffed linters by means of heated air. Wood pulp may also be used to make the basic powder nitrocellulose and its use was highly developed during WWII when demand for powder exceeded linters supply. Wood pulp is much more widely available and during the war its cost was less than half of that of linters. The (wood) pulp used by Hercules, now called ‘Alliant’, during the war was known as “Purayonier,” of very high purity, containing a minimum of 90 per cent virgin cellulose of a high alpha content. This pulp was supplied to the powder mill in the form of heavy paper, about .050″ thick, much like rough blotter stock. It was shipped in 550-560 lb. rolls 30-32″ wide. As received it had a moisture content of just about 6 per cent so was run through a continuous feed drying furnace. This reduced moisture content to approximately 0.5 per cent. Naturally, extensive sampling and testing verified its purity first. After drying the (wood) pulp was shredded in special machines into a fine fluff, very much resembling the (cotton) linters. At this point it was ready for the nitrating processes which are identical to those used with linters, except for individual charge weights. The Du Pont mechanical dipper method of nitrating cellulose is the most commonly used in the world and as the Du Pont process was purchased by the Australian Defence Department, ADI many years ago, we can presume that it would be the method used in Australia. Other methods are Pot; Nitrating Centrifugal; and Thompson Displacement, but we need not go into them here. At this point a brief explanation of the functions of the required acids will be necessary to follow the mechanical nitrating processes. Sulphuric and nitric are the basic acids used. Nitrogen from the nitric combines with the cellulose to form nitrocellulose. Sulphuric has the job of combining with water released by the nitric, thus preventing dilution of the nitric during the nitration process. Naturally, the continuous handling and storage of such large quantities of acid present a major problem. Often nitric acid is manufactured in a companion plant next to the powder mill. Both acids are used at strengths (nitric 98-99 per cent, sulphuric 68 per cent) which are most injurious to materials and equipment. Miles of stainless steel and other special alloy piping, tanks and plumbing are required. Two basic nitrocellulose’s are required for smokeless powder production and they will be discussed in edition 39. Chrony Chronogrphs measure the velocity of your ammunition. You have now should all have the free Ballistic Calculator if you haven’t got it already there is a link further on this page. Without a Chornograph to give you a known velocity, shooting is all just guess work. There are only two known facts available to a shooter, the hole it makes in the target and its speed. (Pressure guns are not available to us mere mortals) You cannot test, your rifle and ammunition by how much noise it makes or how hard it kick’s you. Get a chronograph, they have never been any cheaper for this quality and if you don’t do it now they will be dearer when you want one next. Then you will be kiching yourself harder than a .600 Nitro Express. 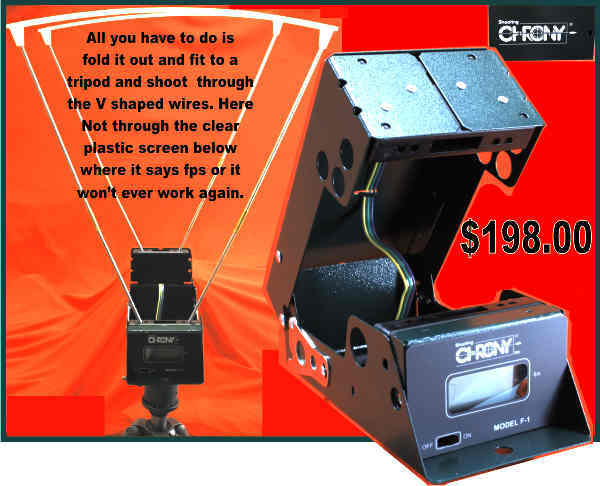 They fold up really compact to take to the range, open them up shoot through the wires and the light meters will give you a print out on the little screen. They fit onto nearly every camera tripod. One of our customers fired through the clear screen, brought it back for warrentry, as it didn’t work. Please do not do this, as they are not supposed to be bullet proof. This week, having heard had to listen to 30 minutes of arrogant bureaucratic obstinance, without getting much of a word in, I decided that it was time again to make a statement, against the despotic gun laws which inhibit our daily lives. Yes, I know most people put up with the 17 week waiting for a Permit To Acquire, the two month wait for a licence, the $1338. To non profit organisations for a Police approval to run a small 100 yard shooting range. The $1500. for a Dealers Licence a smaller amount for a Armourers Licence. We all pay for our own chains. Many people who have had a hard time do not complain to their local member of parliament, even though he is probably a nice man, they do not want to suffer any retaliation from the Weapons Licencing Branch in there State, or any senior policemen, as we are all dependent on our jailers, we have businesses, we have licences so we are vulnerable. I have upset them before and had to weather the slings and arrows of outrageous fortune which has placed unjust burdens on my family and staffs income. My little protest went off in the mail earlier this week, hopefully it will act like a candle and shine some light into people minds. If there is anyone else out there who really wants to do something please reply to this email address, don’t worry I am not proposing a revolution just the exercise of our peaceful rights. Twenty years ago, I dug my heels in and had a little win, the Magistrates Court awarded me $1800 costs, against the Police Commissioner Mr Jim O Sullivan. I wrote and asked him to pay in 14 days, he failed to do so, (I thought he might appeal, but he did not), they recalled every Dealers Licence in the State and issued them another one, except me. They changed the Weapons Act to fix up the hole. I wrote to the Commissioner again and asked for the $1800. Again no reply. I took my letter to the Magistrates Court and got a court order that the Commissioner had to pay within 14 days, I sent the Commissioner a copy of that. Still he did not pay, so I returned to the Court House and made an Application to the Court for a Warrant of Commitment, that was so I could arrest him. The Clerk of Courts, was petrified by this time, so before I could get in to see the Magistrate and tell him that the Commissioner had defied his orders and show him the registered mail slips to show he had been served properly, I could see the Clerk running across the road to the Police Station and back. He came to me and asked how I wanted to be paid I said cash or a bank cheque, as he could put a stop on his own personal cheque and I would be back to square one again. I watched him run across the road to the Police Station again. I was at the court registry counter asking how long I would have to wait to see the Magistrate for this short matter, when he ran back through the front door, a bit breathless by now, “Its Coming, Its coming,” he said, “they have sent a police car down Mary Street to the bank to get a bank cheque” . At this time a reporter from the local paper began to ask me what it was all about, so I told him, he loved the story. I ended up pointing out to him that the separation of powers doctrine, had been failing that the separation between the executive power the Police and the Judiciary was a little thin as now the court staff employed by the Justice Department was delaying my appearance before the Magistrate to save the Commitment to incarceration of the Police Commissioner for the State of Queensland. It made the Courier Mail the next day. That little victory had began by a bureaucrat who was over reaching his power, my resistance to it, had escalated the matter and it eventually, in future years caused the loss of millions of compensation that was due to our family companies. I will still be suffering from the fallout today, and it could be all starting again. I cannot walk away and leave corruption to prosper. The manager of administration in the police force who had caused that dispute and mis represented the legal position to the Commissioner, eventually accepted one of my phone calls. Here below is some of his comments, that may be slightly out of order as it was taken from the hurried notes, I wrote up the time. It give a good insight into what some bureaucrats think about ‘us’ the individuals, in relationship to the new gods of government. “Trouble with you, Owen, is you’re too quixotic. Too dammed pedantic. You will end up in the clink you’re a fool. You got what you wanted from me. It’s my turn now”. “Your neck’ was his answer. We’ve taught people to unite. This makes one neck ready for one leash. “You think you have a movement, you think you have friends, they blather on about the New World Order, in that magazine of yours. Your all wrong, we have the power. I’ve always said just that. Clearly, precisely and openly. It’s not my fault if you wouldn’t listen. I told you when I took over, that I am in charge. Like all my predecessors. I’m luckier than they were. I inherited the fruits of their efforts and I shall be the one who’ll see the dream made real. I recognize it. I shall rule this place and through this place, all of Queensland” “Whom …?” I said ” You lot. We have the lever. If I can rule one single man’s mind, I can get the rest of you. It’s the mind, not swords or fire or guns. That’s why the Caesars, the Napoleons were fools and did not last. One mans mind, Drive a wedge in, get our fingers in it, and the man is ours. We don’t need a whip, he’ll bring it to us and ask to be whipped. 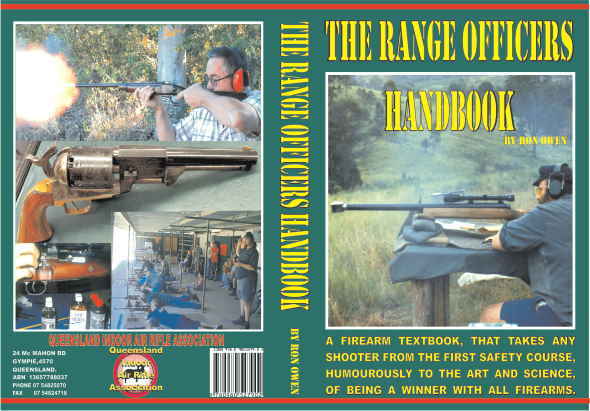 (Asking for a shooter licence) Set him in reverse, and his own mechanism will do your work for you. Use him against himself. Make a man feel small. Make him feel guilty. Kill his aspiration and his integrity. Kill integrity by internal corruption. Use it against himself. Direct it toward a goal destructive of all integrity. Tell man that he must live for others. His mind, then gives up its self-respect. We have got him. He’ll obey. He’ll be glad to obey, because he can’t trust himself. Kill a man’s sense of values. When our coppers come to see you, try talking morals to them, you will find they won’t have any. Kill his capacity to recognize greatness or to achieve it. Good men can’t be ruled. We don’t want any good men. Destroy them from within. We will set the standards, to the least, to the most bungling, then we stop the impulsion to effort in all men, great or small. We stop all incentive to improvement, we ruin excellence. Laugh at me Owen, but within a few years you will know we have won. The public will worship idiots, you try and win with reason, soon no one will know what logic and reason is. Police press releases make the news. We won’t set out to destroy your values, or take all your guns at once, we will make you all get one sort of gun, we will make everything average no good or bad, just average. No one will ever want to excel at anything. We won’t allow men to be happy or value anything. We will take away from them whatever is dear or important to them. Never let them have what they want. Make them feel that the mere fact of a personal desire is guilt. There will be so many laws they will always be guilty. No longer any natural rights. This country will be dedicated to the proposition that man has no rights, that the State is all. The individual held as immorality. No virtue permitted, except that of service to the State. Unhappy people will come to us. They will betray you. Nature allows no vacuum. Empty a man’s mind, and the space is ours to fill with guilt. Haven’t you been able to catch the modern theme song`Give up, give up, give up, give up’? Look at the moral atmosphere of today. Everything enjoyable, from cigarettes to the profit motive, is considered depraved or sinful. Just prove that a thing makes men happy, and you’ve destroyed it. We have tied happiness to guilt. And we’ve got mankind by the throat.. Fools think that ridiculous legislation is just nonsense. But there’s always a purpose in nonsense. Forget firearms, the only people with firearms will belong to us or be fully dependent on us. You use the weapon of ‘Reason’ against us. So it will be taken away from you. Watch the politicians at work, we will school them well. They will never deny reason outright. We never deny anything outright, that would give our hand away. We don’t say reason is bad. We just say that reason is limited. That there’s something above Reason. The field’s inexhaustible. Instinct, Feeling’,` Intuition’,`Dialectic Materialism.’ If we get caught at some crucial point and somebody tells us that our philosophy doesn’t make sense. We tell them that there’s something above sense. That in this instance we must not try to think, we must feel. We must believe. Suspend reason and anything goes in any manner we wish, whenever we need it. We’ve got him. Can you rule a thinking man? We don’t want any thinking men. Your finished Owen”. Then he hung up.